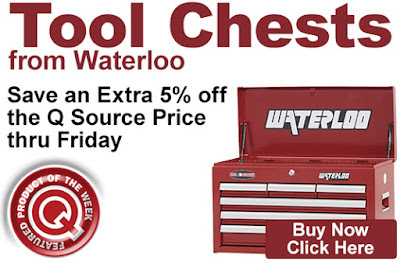 Save an extra 5% off the Q Source price on Waterloo Tool Chests. Get this discount when you add an eligible tool chest to your shopping cart. Our Featured Product promo is valid Monday, May 29, 2017 and runs through Friday, June 2, 2017. Available in red or black and offering two to ten drawers, eligible chests feature double-wall construction, various locking and latch systems, sturdy drawers, non-slip liners, and limited warranties. Visit the individual product pages for more detailed information. Click here to shop for eligible tool chests. For further questions, call us (800-966-6020), or send us an email. Please note: This promo is valid only at QSource.com and expires on Friday, June 2, 2017.